I don’t think that is the largest tire in the world, either. I remember a BIGFOOT that had bigger tires in the 80’s. 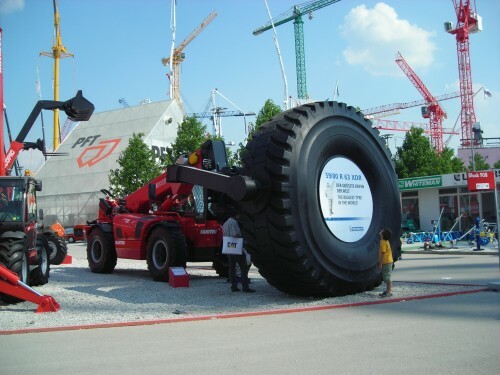 Maybe that’s the biggest tire used on a crane of some sort… they seem to be in “Crane World”. That’s Pattaya Beach, Thailand, my friend. I hope you had as much fun there as I had. This tire is used on the “Leibherr T 282 B mining truck” it is a Michelin 55/80 R63.. It is not the biggest tire ever produced.. as far as diameter.. Bigfoot has those… but it it the heaviest… they cost in the the area of 750K each and will last a in production mining truck about 6 months.. they also have monster chainmail sets to help protect them…. This is the biggest tire! Michaganis (michaganians? michegans?) say so!